Boil sufficient water in a deep non stick pan. Add the spinach and when the water comes to a boil again, drain the leaves and dip them in iced water.Drain the spinach and squeeze to remove excess water. Chop half of them finely and puree the remaining. Heat 2 tablespoons oil in a non stick pan. Chop 10 garlic cloves. Add the cumin seeds, chopped garlic to the hot oil and saute till well browned. Add the green chillies to the pan and mix. Add Chopped spinach, salt, garam masala, kitchen king masala and mix. Cook for 1 minute. Add the spinach puree and mix. Cook for further 3 to 4 minutes. Switch off the flame. Add Lemon juice and mix well. Heat another non stick pan and add the remaining oil. Crush the remaining garlic cloves and add. When they turn a light brown add the sesame seeds and saute till brown. 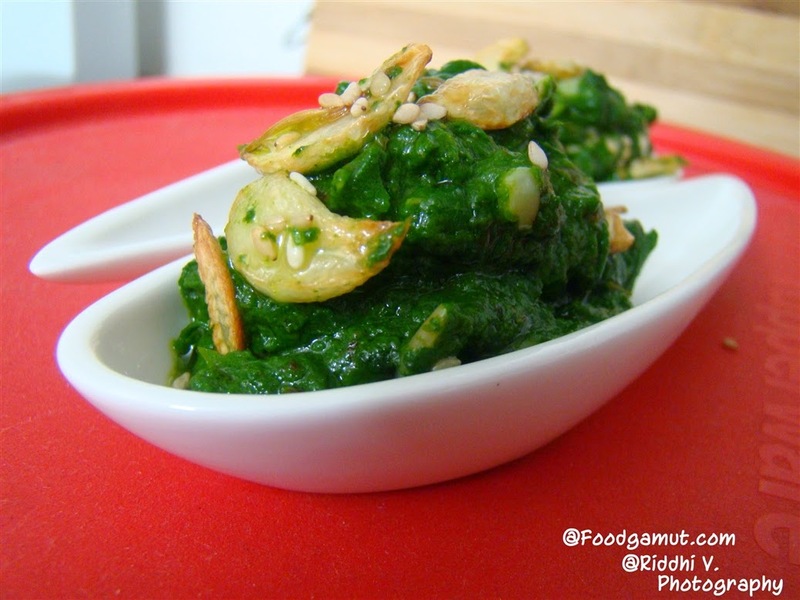 Transfer the spinach mixture into a serving bowl, drizzle the garlic-sesame tempering over and serve hot with naan or parathas..